This is my recipe for Lemon Garlic Chicken. This is another memory of a favorite childhood dish my mom made quite a bit. I know there are many versions of this dish out there, but I’m going to keep mine as close to my mom’s recipe as I can. I’m also making this dish for a close friend of mine, Cheri. She was a big part of mine and Melissa’s life. Today Cheri has a family of her own and because she loved this dish so much, this is for her. Love you girl! I like to start with the Yukon Gold potatoes. I think they work best, and it’s what my mother used. Trying to stay with tradition, with a few minor changes, gives my Lemon Garlic Chicken a modern makeover. 1 large sweet onion, thinly sliced in half moons. Start by taking 6 medium-size Yukon gold potatoes cut them into quarters placing them into a large mixing bowl. Add the olive oil, 2 tablespoons of fresh chopped rosemary leaves, 2 tablespoons of Kosher salt and 1 teaspoon fresh ground black pepper, toss to coat all the potatoes. Next, divide them evenly onto two baking sheet pans, spreading them out into one even layer. Roast in an oven for around 15 minutes. Halfway through the cooking process, turn the potatoes allowing all sides to become light golden brown in color. 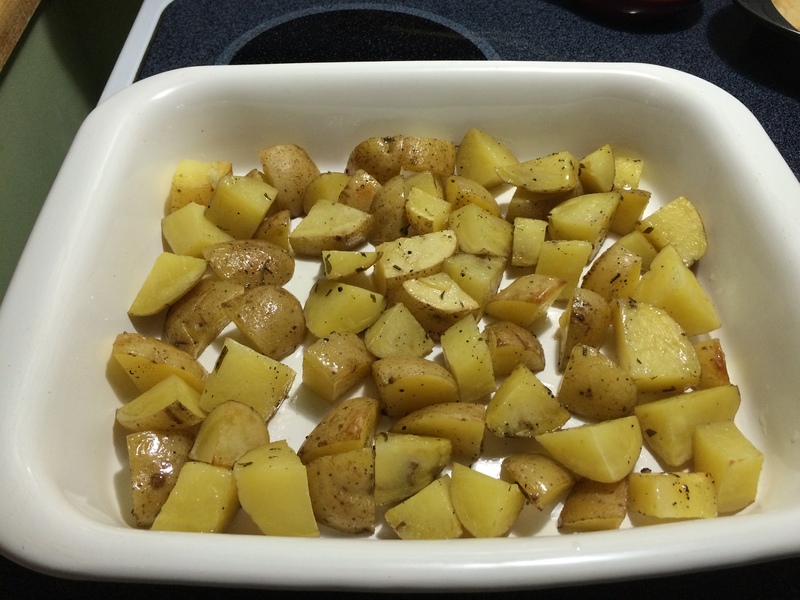 Remove the potatoes from the oven and transfer them to the baking dish. Spread the potatoes out to evenly cover the bottom of the dish. In a large sautépan on medium-high heat add 1 tablespoon of olive oil. Add sliced onions, Kosher salt, and pepper to taste, sauté until just soft and translucent, 5 minutes. Turn the heat off and set aside. In a large mixing bowl add the Caesar dressing the remaining chopped rosemary leaves, mix to combine. Lay the chicken breast out onto a plastic meat board. Using a silicone pastry brush, paint both sides of the chicken with the Caesar dressing. Instead of using Italian style bread crumbs, which my mom used, I’m using Panko bread crumbs. I like how they’re lighter and give a little more texture to the coating. In a bowl add the Panko breadcrumbs and the remaining chopped fresh parsley, mix to combine. Dredge the chicken into the panko coating both side. Lay the chicken on top of the potatoes, as seen in the picture above. Pour the cup of chicken broth in the bottom of the baking dish. This will prevent the potatoes from burning. Drizzle 1 to 2 tablespoons of olive oil over each of the breaded chicken breasts. Bake for 20 minutes. In a medium-size bowl add olive oil, fresh chopped rosemary, grated garlic, lemon zest, lemon juice, and unsalted chicken broth, whisk to combine. Pour those ingredients into a saucepan. On medium heat bring the sauce up to slow bubble reduce to a simmer and cook for 5 minutes. Fifteen (15) minutes into baking the chicken, remove the chicken from the oven, scattering the sautéed onions on top then ladling half of the garlic lemon sauce over the chicken. Cover the baking dish with foil and continue cooking for another 35 to 40 minutes, or until chicken reaches an internal temperature of 165 degrees F.
Remove the chicken from the oven and let rest covered for another 15 minutes. Serve in a large deep serving platter family style. Ladle the remaining lemon garlic sauce over the top and sprinkle with Italian parsley. Bring the platter of Lemon Garlic Chicken to the table. Serve hot. I’m dedicating this dish to the loving memory of my mom, Doris Domicole.